With a few strokes of a ballpoint pen, it was back—my daughter’s dolphin. 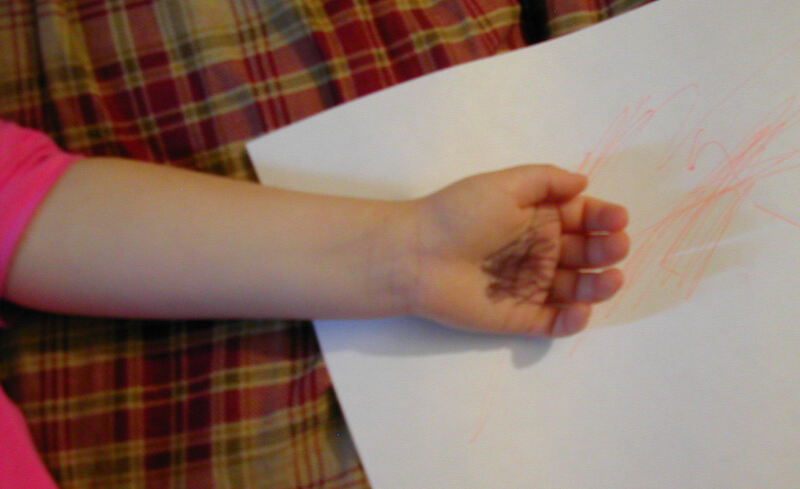 She had been drawing on plain white paper while watching TV, and then, for some reason, decided her hand offered a more satisfying surface. I didn’t object, partly because I didn’t have time to. As I said about earlier cases, I am not sure what made this a dolphin. She may have actually perceived the sea creature in her small, sensitively-applied matrix of lines. * Or, maybe she has decided that the word “dolphin” means “artwork on one’s hand.” I hope I will understand some day, but I don’t really need to understand. And it’s probably not my place to do so. Listen to it all. So much talk of division and downward spirals. So much anger hinging on word choices, on language. Look at the pictures. Murderous website graphics masquerading as political activism. Murder itself, taking the place of political self-expression. Faces full of disbelief and doom. Feel what’s happening. Cracks spreading in our national community—while everybody runs away from them in horror, opting for Jersey Shore surreality and house-flipping fantasies instead of examining the cracks and trying to fix them. Yes, this is something you can feel. A few days ago we moved further away from our ability to separate language from violence. A psychopath pushed us beyond that. People are saying he wasn’t influenced by what he read and saw, that his rampage sprang from something wholly unrelated. But if we want to genuinely analyze the trouble we’re in, we can’t simply erase the messages generated by our “content economy” from the equation. Language is as real as ice and snow. It has consequences. Many of us wonder what role it can have in getting us to a better place. Is such a thing possible. Is it simpy a matter of getting people to talk to one another. I think of the languages spoken in my own neighborhood. We don’t converse much with our neighbors, partly because we’re busy and so are they, but also because we aren’t fluent in Polish, Spanish, or Japanese. I don’t mean to suggest that English isn’t spoken frequently, because it is, even in the households surrounding us, but these same households are dominated in one way or another by a foreign tongue. No matter how much I would like to talk with the people inside, there is very little I can say to many of them. That hasn’t stopped the stucco painter who lives across the street from plowing snow from our sidewalk, or (especially when our kids were infants and we were visibly exhausted) mowing our front lawn. One time I asked his daughters how to say “hero” in Polish. I’m not sure if the message got through, but at least I tried. Today, his mother-in-law, who is in her 60s and equally English-averse, struggled alone against the snow in their driveway. I stopped shoveling ours and crossed over to help her. She exclaimed “Thank you!” to which I said, “No problem,” and a few minutes later she muttered, “Heavy.” That was the extent of the conversation, verbally. What we were saying to each other in a larger sense, as part of an ongoing dialog spanning winters and summers, was much warmer. The Latino father to our right speaks no English. His sons have also plowed our sidewalk, and one afternoon in August, after I tried explaining my hedge-trimming plans to him, he abruptly gave us some of his home-grown tomatoes. They were delicious. From the septuagenarian on our left, I hope to some day elicit (with great difficulty, no doubt) a few reflections on her Japanese ancestry. I just haven’t found a way, yet—although I have shoveled her driveway, and that will suffice for now. 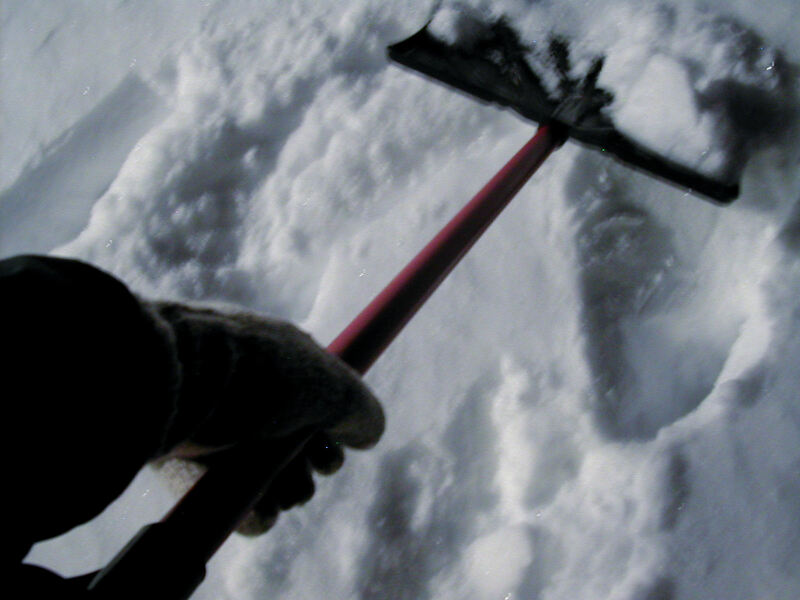 We can shovel our way to understanding, if words aren’t working. If we so wish, we can start giving each other simple things, offering help across the hedges and across the aisles, instead of raving about the theft of America and who’s got whose hands in whose pockets. Let’s face it—we aren’t hearing each other because, all too often, our words are absurd. For once, let’s put the words on hold. If your neighbor isn’t listening, stop yelling and start clearing a path to his door.